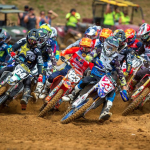 With the AMA Supercross season now over, the American Motorcyclist Association congratulates the three riders who claimed AMA No. 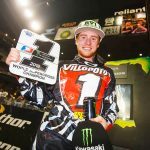 1 plates during the 2014 AMA Supercross season — Ryan Villopoto, 450SX champion; Justin Bogle, 250SX East champion; and Jason Anderson, 250SX West champion. 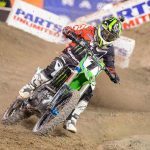 Ryan Villopoto, from Seattle, Wash., locked up his fourth straight AMA Supercross premier class title in the series’ penultimate round, clinching at MetLife Stadium in East Rutherford, N.J. In so doing, Villopoto joined AMA Motorcycle Hall of Famer Jeremy McGrath as the only riders with four consecutive championships. 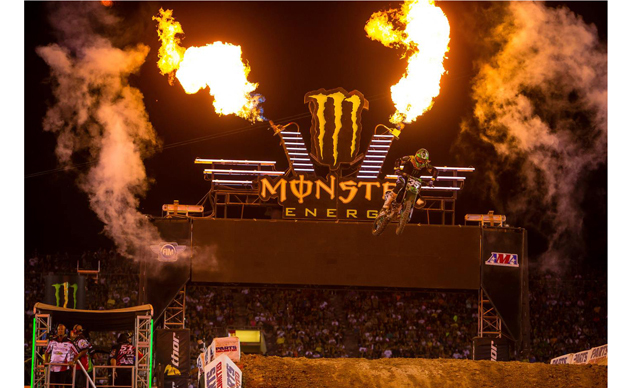 For the 2014 season, Villopoto claimed seven main event wins in the 17-race series, including the Las Vegas finale. Villopoto races for Monster Energy Kawasaki. Justin Bogle, from Cushing, Okla., won the 250SX East Championship, finishing second in Las Vegas behind Star Racing Yamaha’s Jeremy Martin. For the season, Bogle had two wins and three runner-up finishes in the regional championship. Bogle races for the GEICO Honda team. Jason Anderson, from Rio Rancho, N.M., won the 250SX West Championship. 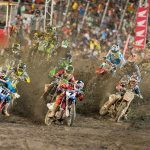 Anderson finished sixth in Las Vegas, earning enough points to claim the title over Troy Lee Designs Honda’s Cole Seely, 193 to 188. Anderson had four wins over the course of the regional championship. Anderson races for Rockstar Energy KTM. The 2015 AMA Supercross season kicks off in Anaheim, Calif., next Jan. 3. The complete 2015 series schedule is below. For updates, see the AMA’s official series website www.amasupercross.com and the official AMA series Facebook page www.facebook.com/AMASupercrossChampionship. Jan. 3 Angel Stadium Anaheim, Calif.
Jan. 17 Angel Stadium Anaheim, Calif.
Jan. 24 O.Co Coliseum Oakland, Calif.
Jan. 31 Angel Stadium Anaheim, Calif.
March 7 Daytona International Speedway Daytona Beach, Fla.
April 18 Levi’s Stadium Santa Clara, Calif.
April 25 MetLife Stadium East Rutherford, N.J.